Written in partnership with The Sleep Help Institute. Age, an old injury, and a failing mattress are only a few of the many sources of sleep-disrupting pain. But no matter the cause, the result is the same: sleep deprivation. Any time you find yourself getting fewer than seven hours of sleep, your body changes the way it functions. The brain, immune system, and even your appetite and metabolism change as you lose sleep. And, the more sleep you lose, the more intense the effects become. Given how impactful a lack of sleep can be, the best way to improve your sleep is to be proactive and incorporate pain management into your bedtime routine. Some commonly-used tools to help manage pain include over-the-counter pain medications like acetaminophen and ibuprofen, but there are also topical ointments and lotions with ingredients that distract your brain from or dull the pain as well. Hot and cold treatments can also be of benefit in helping relieve pain and promote relaxation. Heat brings blood to an injured area and promotes healing while cold reduces swelling. You can alternate between the two or focus on one or the other, depending on your pain needs. The process of finding the right combination can be frustrating but don’t give up. For people living with chronic pain, there is no one-size-fits-all and it takes trial and error to find the best combination to help improve sleep. Sleep is a biological necessity you can’t do without. In the long run, it’s worth the effort to find the pain management behaviours, bedtime routine, and sleep positions that work for you. 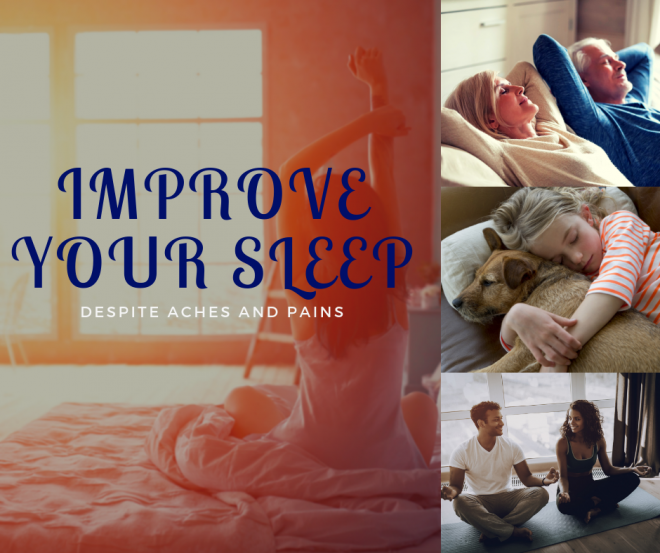 Although your aches and pains may not disappear completely, establishing a healthy sleep routine may help reduce your pain and improve your quality of life. Something that can be just as helpful is building a sleep routine by developing healthy sleep habits. Your behaviours help shape your sleep patterns and prepare you for bed so consider building some healthy sleep habits. Consider trying some of the suggestions below. The brain can be a funny thing. If you have gym equipment or electronics such as a television in the bedroom, your brain can get mixed signals and ramp up activity when you’re ready for bed. Reserve your bedroom space both mentally and physically for sleep. If you want to further improve the conditions then block out light, lower the thermostat, and use a white noise machine to reduce distracting sounds. It’s easy to put off going to bed to scroll through social media one more time, watch one more episode on Netflix, or send an email before bed. We’ve all done it! But your body needs the predictability of a regular bedtime. The brain will adjust the start of your sleep cycle based on your preferred schedule. By going to bed at the same time each night—even weekends—you schedule your sleep cycle so that your brain releases sleep hormones at the same time every night and strengthens your response to those hormones. Taking a few minutes to stretch your body before getting into bed can help you get to sleep and wake up with less pain. You can use a set routine or build a program specific to your body’s needs. Target areas in the body where you hold tension or there’s pronounced “tightness,” such as your neck, shoulders, back or hips. When you stretch slowly, you should feel tension in your muscles, but never pain. Stretching as little as two to three times a week can improve your flexibility and make a pronounced impact on pain. Stretching regularly also helps you maintain a normal range of motion, which is important for preventing injury as you move throughout the day. A pillow between the knees can often help hip or back pain. If you’re a side sleeper, you may be able to tolerate sleeping on your back with a body pillow behind you to take the pressure off your shoulders. Memory foam mattress toppers or therapeutic pillows are other options that can relieve pain. Many people find that sleeping on a mattress that’s worn out or too soft can exacerbate back pain, while sleeping on a mattress that’s too firm can exacerbate hip and shoulder pain. Make sure that your sleep surface is the right fit for you, and consider getting a new mattress if you think you need one. Our final suggestion. It can be part of your bedtime or morning routine. Meditation has been shown to reduce the anticipation of pain, which may reduce the perception of pain itself. Mindfulness meditation can even trigger the body’s relaxation response, which may reduce your heart rate and blood pressure. Stretching before bed is an effective way to decrease pain but sometimes it’s not enough. If your pain is persistent, seek advice from a chiropractor. Chiropractors are highly educated and specially trained musculoskeletal experts. Your chiropractor can treat aches and pains, as well as build customized stretching routines and whole-body wellness strategies in conjunction with your chiropractic treatment. Consult with your chiropractor or click here to find one near you.